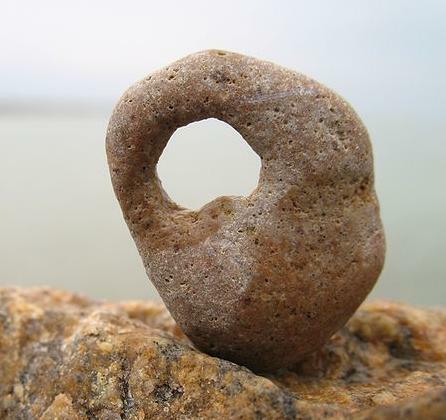 Hag Stone is a stone with a hole through it, which is believed to ward off the dead. In European, this stone keeps the "evil hag" spirit away in order to prevent her from stealing horses and children. (see Hag) The hag stone is especially used as a favorite talisman by Cunning Folk to dispel the evil eye. Other people hang this stone in bedrooms to prevent the succubus-hag from ridding on people's chests during nightmares. This is similar to swayambhu shakti in Hinduism like swayambhu linga. Power of great goddess is there. It also represent Egyptian goddess Isis. In Italian Witchcraft the holed stone is associated with fairies, and often referred as the holy stone. It is considered a doorway, or key to the doorway, into the fairy kingdom. It Italian folk magic, it is believed these stones have the power to bind a fairy to one's service for a length of time. It also cures bad dream. Price 50$.